Feeling a little disinterested about your partner or your relationship? Letting the daily tedium grind down the sparkle between you two? Taking your partner for granted? These are common problems. Today we have less time and energy than ever before to focus on family and loved ones let alone on ourselves. If you're low on time and energy, forget the gym (for now) - experts say it's more important to give yourself the time and permission to get timeout and rest for yourself before you focus on anything else. This makes sense because until you are rejuvenated, physically, mentally, spiritually and emotionally it is a pretty big ask to try to help anyone else, even if they are family. Did you know? A lacklustre or unfulfilling relationship can drag you down more than you realise? Indifference is insidious - like carbon monoxide - no outward drama, but a silent killer of love and energy nevertheless. Slowly but surely, like tiny drops of water on granite, the solid Rock of Love gets chipped away ... and along with it your personal vibrance seeps away ... unless you intervene. Here's how, start with yourself. A great way to REST, relax and then rejuvenate loving feelings in yourself is to settle down to some quiet time where you can read, watch and listen to soothing videos / music that LIFTS your spirit and fills your empty tank at the same time with high-octane love-fuel. Make sure that you get at least 30 minutes each day to recharge your batteries. You're not the energiser bunny and you don't need to or want to be that. It's harder to feel love and goodwill if you're tired and emotionally frayed ... when you love and lift yourself a little you end up loving and lifting your loved ones manifold over. When you notice disinterest, which is emotional apathy and the canary of 'Love Tunnels (gone wrong)', creeping into your relationship in either yourself, your partner or both, that's when you should seriously heed the warning signs, that is, if you still want to be TOGETHER. RULE 1: Remember this Golden Love Rule! RULE 2: Don't Forget Rule One! When you stir some passion into your love-life you will notice a more vibrant and energising world. You can later share the good stuff that you discover with your partner when you are both chilling out together. Btw, schedule in your joint, chill-out time in your organiser-diary on a regular basis, if you haven't done so already. In a busy world, this is a must-do, to book VITAL time for yourselves - and then guard this time jealously! Unless it's an emergency let NO man (or woman!) 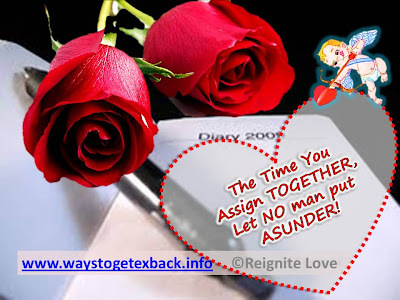 put asunder your assigned time together as a couple, then do the things you used to do when you first met - date again, mate again, love again - and discover the Spring in your steps ... all over again! Turn the Tides of Passion .. watch Love Tides Poem!